With the number of worldwide social media users growing rapidly, one cannot deny that social media is now playing an important role in building your brand awareness. Just like other social media websites, Google Plus is also another great platform which you can use to give exposure to your brand on Google Plus social networking. You may share anything from photos, video, news, or even start a hangout with anyone within your circle. One of the great benefits of having a Google Plus brand page is to drive traffics towards your website by sharing the content to your social network. It also serve as an medium to strengthen your relationship between your products and services with your targeted audience. 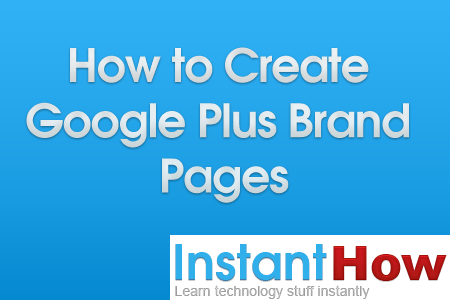 With so much to offer, why not start creating your Google Plus Brand Page now. In the following guides, we'll be sharing how to create your own Google Plus Brand Page from scratch and also some important tips. Visit https://plus.google.com/brand and then click on Create Google+ Page. It will then ask you to specify your brand name. Enter the brand name that you would like to create and click on Create. Click on Enable link after that. You should have created your own Google Plus Brand Page by now. Now we'll need to update your page details. On the left panel, click on Profile. 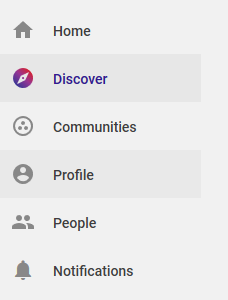 From your Google Plus main page, click on Edit Profile to proceed. Under this section, we'll be updating the cover photo, profile photo and also specify a tag line for your brand. Click on Save once you have done with the necessary changes. 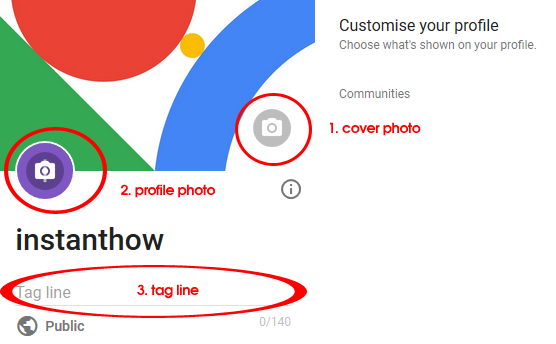 You should have your brand cover photo, profile photo and tag line displayed on your Google Plus Profile Page by now. Next, we will be updating other important info like the website links, contact info, story and etc. Click on About link to proceed. Click on the add info button. Select Sites and then provides the details for your brand Website. 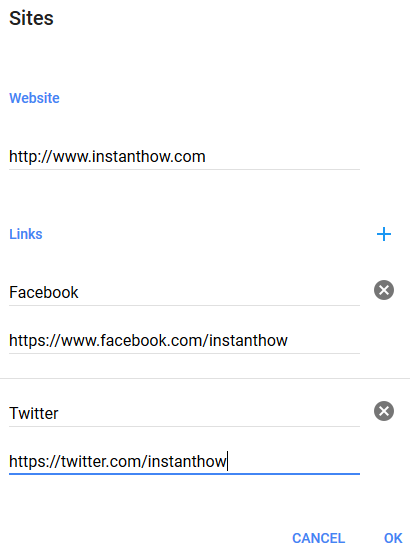 As for links, you may enter other social media links for your brand eg. Facebook or Twitter. Click OK after you've entered the details. By now you should see your websites links being updated on your Google Plus About page. Now we need to change these details available to public from the default settings private. Click on the Private icon (lock) and change it to Public. 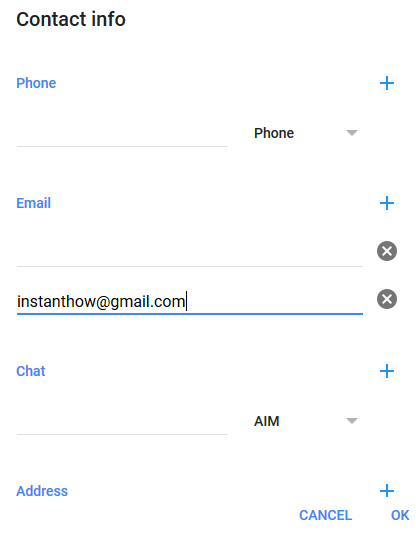 Click on the Add info button again, and select Contact Info.Provide your Brand contact details like the Phone number, email, AIM and address. Click on OK once you've entered all the details. Again, set the contact info details to public from private. Lastly, it would be nice if you can write a brief story or introduction about your Brand. 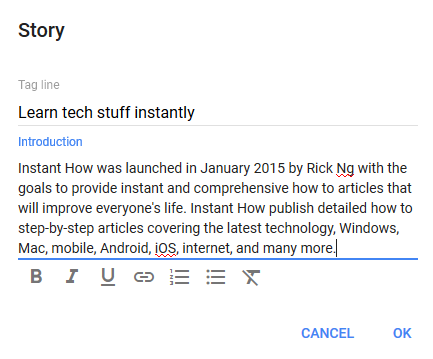 Click on Story and write something under the Introduction. Click on OK to save the description. 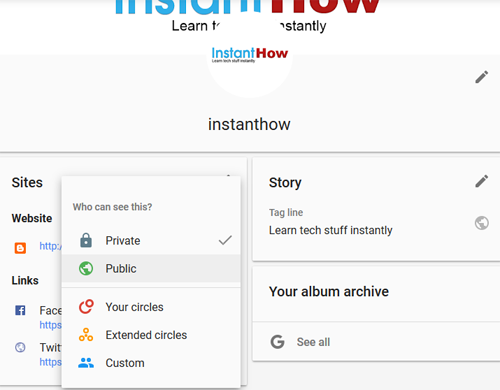 Basically, you've setup all important information for your Google Plus Brand Page. You can now start posting photos, videos, or anything about your brand by clicking on the Write icon at the bottom right.